Alex is an amazing four year old little boy. He lights up a room with his presence, and even though Alex has many challenges to overcome, he is always optimistic, happy, and smiling. He is incredibly smart and has an impressive memory. He enjoys going to preschool and has made many friends there; he can be quite charming. He loves super heroes, Legos, and traveling to the beach. Alex has a progressive neuromuscular disease called Spinal Muscular Atrophy that affects the nerves that control his muscles. It affects his body by slowly robbing him of the ability to move his muscles as the nerves become sick and die. He has never been able to stand or walk, and struggles with using his arms and maintaining trunk control. He has been on a medicine called Spinraza for the past year and half and, thankfully, it seems to have halted his disease from progressing any farther. We are hopeful that he will continue to receive this drug and that it will keep the disease at bay until further treatments are available. Our family quickly discovered that there are many wonderful things that Alexander can do with the assistance of modern medical devices and technology. We were motivated to get the best chair, lift, stroller, and car seat that we could to make his life as comfortable as possible. Like many families in our situation, we began to make hard choices by investing in those things that would be the most impactful to Alexander. 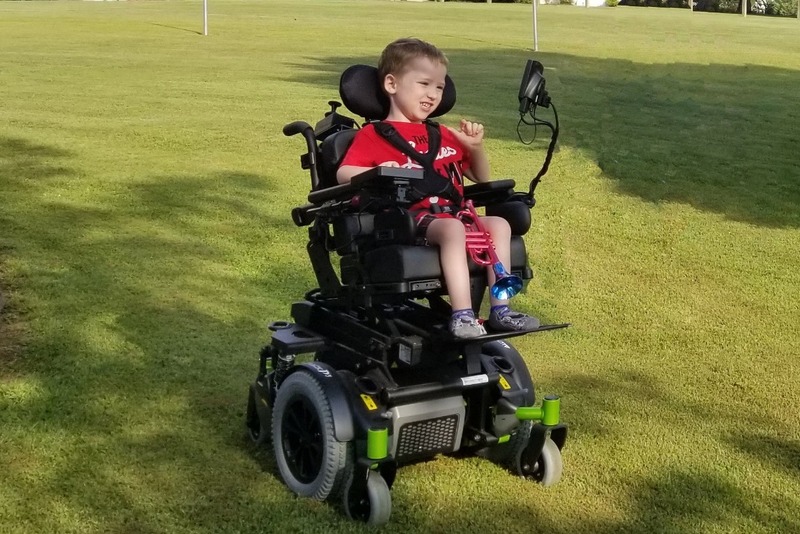 We've been very lucky to receive love and support from our family, community, and non-profit organizations and have received most of his equipment from CureSMA or by purchasing from past fundraisers. The most recent addition to Alexander's life has been his powered wheelchair. We call it the "Super Go-Go." He has spent the last 6 months using his powered wheelchair to experience a level of mobility and independence that he hasn't ever had. He loves to join his brothers in their bedrooms to play together, even if it isn't always at a mutually agreed upon time! He's chased them through the park and strolled with Charlie, our golden retriever, through our neighborhood. This wheelchair has brought him such freedom and fun. He can be a kid. Transporting everyone and everything is quite the challenge. We are lucky that we were able to purchase a hitch-based platform and ramp that has allowed us to take Alexander's powered wheelchair with us to a few locations. This has worked somewhat, but the platform is quite heavy, takes two to install, and is difficult to use to load the 350lb powered wheelchair to the rear of the vehicle, especially on soft or uneven ground. It also exposes the wheelchair to the weather and, many times we just can't bring it along because of the rain or snow. The most pressing issue for us, however, is Alexander's safety. He is growing so fast! He has finally started to put on some lbs and boy is he tall, but his growing size continues to make it difficult for us to safely transfer him from his chair to the vehicle. Alex's wheelchair represents his legs. That's his freedom and independence. Most of us don't ever think about just grabbing our things, running to the car, opening the door and buckling our belts to hit the road. For Alex, this isn't so simple or straightforward right now. He deserves to be able to stay in his powered wheelchair at home, use our new ramp towards our driveway, and drive into a vehicle to travel like the rest of us. Safely, securely, and quick enough to encourage many adventures. And that leads us to this campaign and what we are fundraising for. The most expensive piece of a equipment that many of our families encounter is the accessible vehicle. 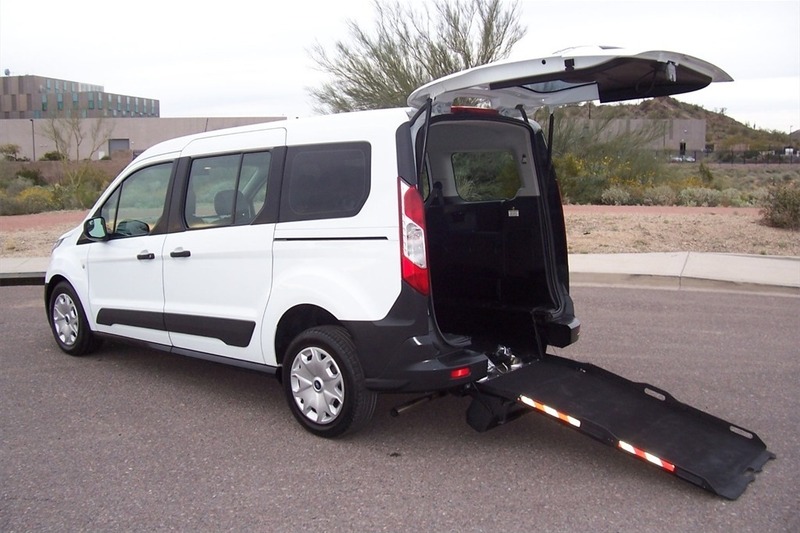 An accessible vehicle is a vehicle that has been significantly modified, usually with lowered floors and a ramp, in such a way that it allows a person in a wheelchair to enter, safely travel, and exit without leaving their wheelchair. Many van modifications cost $20,000-$30,000, depending on the type of equipment used. This price is in addition to the base price of the from-the-factory vehicle. It is highly recommended that a vehicle that is new or with very low miles be used for modification. Unfortunately, this begins to add up quickly when considering a new van cost of between $30,000-$40,000 which, when modified, would total $50,000-$70,000. Eeek! Our goal is to purchase a used vehicle that has minimal miles but has already been converted. We will be using this van for a very long time and expect to drive more than 30,000 miles per year to Alexander's numerous appointments in Columbus, OH and Morgantown, WV. It will also be the primary vehicle for family travel since we will want to always bring Alexander's powered wheelchair (his legs!). We have found many used vans in the $30,000-$35,000 range from private sellers that would work for us. It is important that we have a very reliable vehicle that meets modern safety standards since none of Alex's doctors are in our local area. We have been saving hard and have so far put aside $8,000 for the new van. This includes the sell of our current vehicle towards the replacement. We will continue to save, but this is where we once again need to ask our family and community for help. 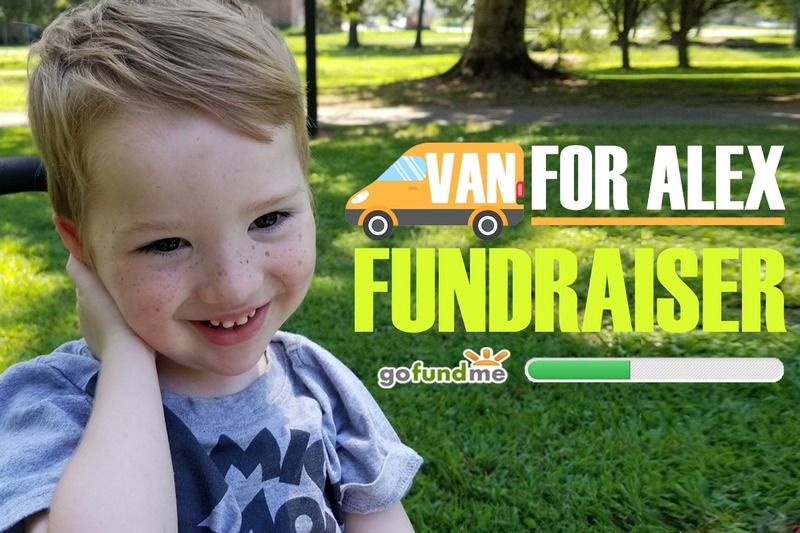 We need to close the gap in our savings and the cost of this critical vehicle so that we can more safely and securely travel with Alexander to his appointments, therapy, school, walk-n-rolls, parks, and other adventures. Raising this amount of money will take some time and heavy lifting, but we can do it. Alex is in our corner! A) Share this page to your social media platforms of choice. Let others know about our story and our mission to get Alexander what he needs! B) Share your fundraising ideas to us directly. We'd love to partner with local organizations or churches that may have an interest in our campaign. C) Create your own fundraiser, such as holding a raffle for items donated by individuals or local businesses. D) And of course, if you are able, make a donation using this Donate Now button on this page. No amount is too small! Candy Bar Sales - Concord U.